Edward Maya is a Romanian DJ, musician, performer and composer who is a producer also. He is to perform live in concerts in Pakistan and he will be on peak of his art in Karachi. 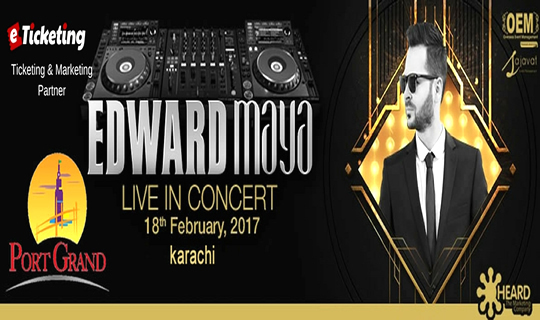 He will perform live at Port Grand Karachi on 18 February 2017. Entertainment lovers in the metropolitan city and close by areas can enjoy Stereo Love fame playing entertaining Mayavin Music live. Port Grand is an entertainment resort located in Karachi, Pakistan. It is situated along the harbor of the 19th century Native Jetty Bridge that joins Karachi Port Trust to Keamari. Port Grand Food Drink and Entertainment Complex works as hub of shopping, dining, cultural and coastal recreational acts in Karachi. Port Grand is situated on Napier Mole Bridge, a place that is important in the history of Karachi and has played a central role in forming the city it is today. The bridge has been changed into an entertainment and food spot housing a variety of eateries on the climate-controlled area and space for stalls and restaurants of Pakistani and foreign food and a variety of beverages. House, electronic, deep house and electro house are genres, Edward Maya sings in. He has also collaborated with many other Romanian music celebrities such as Akcent and Vika Jigulina. Edward Maya revealed his first single as an artist “Stereo Love” with Vika Jigulina in 2009. His second song “This Is My Life” came in 2010 and his third song “Desert Rain” was released in 2011. Edward Maya has founded his own record label “Mayavin Records” to enhance his career and promote other artists as well. He has launched two studio albums till the date. The Stereo Love Show was his debut album released on 3 December 2013. His second album Angles was released on 4 November 2014.